"It's ok to cry, Hanna...crying is a form of breathing." Narrated in the voice of 14 year old Hanna, My Real Name is Hanna is the true story of a Jewish family on their quest for survival in the Ukraine during the Holocaust. The family eventually takes refuge in underground caves leaving them to try to make some semblance of a life while being cast in complete and total darkness. "What is it like to take your last breath? What if the sound of it gave you away?" *more ugly sobbing* 😩 "It's ok to cry, Hanna...crying is a form of breathing." This is a powerful story about family, hope and ultimately the goodness of mankind. I found this story harrowing from close to the start, even though some of the descriptions of the worst atrocities were left out, as this is primarily a book for young adults. I see no reasons why the vast majority of adults interested in this type of story wouldn’t thoroughly enjoy it as much as teens will. It’s for both adults and young adults. Characters came vividly to life and I loved them, Hanna in particular. But others too. Alla was also particularly wonderful. It surprised me by how little I was annoyed by the characters’ superstitions and how much religion held a place in their lives. Jewish and Christian. Superstitions usually drive me nuts, particularly when they are unthinkingly accepted as they are here, but in this particular story they fit the characters in this time and place and cultures and backgrounds and I could enjoy the narrative without it bothering me at all, and I even found the details interesting. Fascinating actually and I learned a lot. I loved how so attuned to nature/the natural world Hanna and Alla and some others are. And the descriptions of the natural world are marvelous. The chapters are incredibly long and there are only a few. There were some good stopping points within chapters though and I did often stop at them. A haunting and devastating Holocaust story of one Jewish family’s struggle to survive. Hanna is thirteen years old and living in Soviet-occupied Ukraine when the Gestapo arrive in her small town to ‘eliminate all Jews’. She and her family, along with a neighbouring Jewish family, flee to the forest to hide out and avoid capture. From there, they must flee further, taking them into underground caves where they must battle starvation, isolation, complete darkness, constant dampness and disease. Her family’s strength and determination to remain together and survive was very touching and inspiring. What they endured, living in their extreme conditions and always in fear of being found, is unimaginable. Hanna Slivka is almost fourteen years old when her entire world is turned upside down. Hitler's army has crossed into the Soviet occupied Ukraine. They are intent on making the land "free of Jews." Hanna's life goes from exploring with her siblings and helping her neighbor decorate psyanky eggs, to having rocks thrown at her on her walk home from school, to hiding in the walls of her home when the army comes, to eventually leaving everything behind to seek safety in the forest and eventually in an underground cave with several other families. The caves, although they provide protection, do not let in any sunlight, fresh air and keeps them in perpetual darkness both literally and figuratively. They do not know what is going on in the outside world, until their members must leave to find food and hopefully trade with nearby farmers. This book is a well written account of what it was like to live/survive during the Holocaust. Where neighbors either helped neighbors or turned on them. Where hatred and racism tore away people's morals and values. A time when fear and hatred ruled the day. But in the darkness of the caves, humanity existed. People helped people, lives were lived, hope remained, and the true meaning of what makes a home is learned. This is a timely book as there are so very few Holocaust survivors left in the world. My Ma passed away in 2017. Books such as this one keeps their stories and memories alive. No one truly knows what he/she is capable of until they are placed to the test. Readers may ask "could I survive this?" I hope none of us ever have to find out. As I mentioned this book is well written and contains beautiful descriptions of nature. I enjoyed Hanna's relationship with her next-door neighbor and both of their openness and interest in each other's lives. This book showed the strength of family bonds but also showed the strength of friendship and how small acts of kindness can not only make someone's day but can also save a life. This is a wonderful book about courage, survival, and family for readers of all ages but is geared for the YA population. Thank you to Mandel Vilar Press and NetGalley who provided me with a copy of the book in exchange for an honest review. All of the thoughts and opinions expressed in this review are my own. What made this book so special to me? The story,beautifully written,is heart wrenching and yet tender and loving. The unveiling of part of little known Holocaust history was surprising,compelling,and illuminating. But what made it unforgettable was Hanna’s voice—Tara Lynn Masih has drawn a character so alive and believable that my heart became linked with her heart,my eyes became linked with her eyes, and when she hoped...Oh,l hoped,too! I was fourteen believing I may never live to be able to se What made this book so special to me? The story,beautifully written,is heart wrenching and yet tender and loving. The unveiling of part of little known Holocaust history was surprising,compelling,and illuminating. But what made it unforgettable was Hanna’s voice—Tara Lynn Masih has drawn a character so alive and believable that my heart became linked with her heart,my eyes became linked with her eyes, and when she hoped...Oh,l hoped,too! I was fourteen believing I may never live to be able to see my 15th birthday . It was Hanna’s voice that elevated this remarkable story and placed it in what I believe will become a treasured classic on shelves next to classics like the The Giver or the Yearling. Time will tell. Maybe a request for some semblance of a proper burial. Perhaps a plea for remembrance. These are the words that Hanna buries in a tin in the Slivka family’s yard before they are forced to flee their home, their quiet, happy existence, as the Nazis move in to make the town free of Jews. This becomes a journey for survival from their life in the shtetele, this small town, their Polish and Jewish roots, in the Ukraine, to the deep of the forest and eventually to the darkness of a cave finding refuge from the darkest hearts of the Nazis. We don’t see much of the horrific things that happened to the Jews as they are rounded up and sent to camps, but we know of course , and the characters find out as the novel moves forward. They learn that railway cars take away Jews and then the Nazis don’t take them away anymore. They just shoot them as they try to escape through the forest. We do see first hand the hunger and hardship that the Slivka family, their extended family and neighbors endure. There was no food at times. They were starving until one of the men or older boys could safely leave to scrounge what they could. This is a beautifully written, well researched story inspired by a real family who together survived the holocaust by hiding in a cave for well over a year. This is a story of courage, of love, of family, of culture , of religious beliefs, of how it is possible to sustain hope in the face of hunger and darkness and loss. Through the beloved character of Mrs . Petrovich, one of my favorites, the kind Christian neighbor, we are reminded of the goodness of people, so many of whom aided Jews through these horrifying times. Through the characters of the Cohan brothers, we are reminded of the courage of so many who risked their lives to save the people in their community. I was struck that this was about the importance of story telling, both real and wonderfully imagined on a number of levels. When the novel begins, it is Hanna telling her story of survival to her daughter. Hanna’s beloved friend, Mrs. Petrovich, tells her stories through the beautiful eggs she decorates. The spirits of the children as well as the adults were sustained in the dark cave by the voices the children as they say “ tell me a story”. There are stories told in the cave remembering loved ones, some biblical, and some are fables of a sort - all beautifully told. Then of course there is this beautiful story told by Tara Lynn Masih encompassing all of this, itself based on a true one. While this may be geared to a YA audience, it is far from an ordinary coming of age story. I believe it’s an extraordinary story that everyone should read because it’s an imperative reminder that we can’t forget that the Holocaust happened and we can’t let it happen again. This story is told from the POV of Hanna, a teenage girl from a family of five. They, along with around another dozen other persons (extended family and friends) spend a hellacious 18 months just trying to survive in the deep forest and then a miles-long cave system in the Ukraine as the Germans went all out to kill every Jew in the area while Russia tried to regain control of the region. Though there are a lot of chilling moments in this novel, there is also celebration of the human spirit in the fight to stay alive with faith, hope, family, and the sheer will to do whatever it takes. It’s really difficult to fully comprehend what people actually went through during these insane world wars. They lived off “soup” made from residual animal fat leeched from a pair of leather boots, fried centipedes, and leaves. They wore the same clothes for months on end. They did not see the light of day for a year. I can’t even imagine surviving all that, not to mention the constant threat of sudden death. The best and the worst of all those fighting to survive certainly become apparent in this tale. This is a raw, emotional, beautiful story that shows us how strong, courageous, and compassionate humans can be when placed in dire situations. A special nod goes to one of my three favorite characters, Alla Petrovich, at this point. Of course the other side of the coin is clearly apparent as well. We see neighbor turning against neighbor, ruthless mass killings because of religious beliefs, people committing suicide before they let anyone else kill them. To the author’s credit, despite the content, the book is a very readable and captivating page-turner. I could barely tear myself away from reading it and finished it in little more than a day. I also want to mention the incredible research that went into this novel. Please make sure you read the section entitled “A Historical Note” at the end of the story. I again learned something new about the Holocaust from a historical fiction novel. This time it was the story of the people who fled to the deep forest areas and to the caves to try to escape certain death. 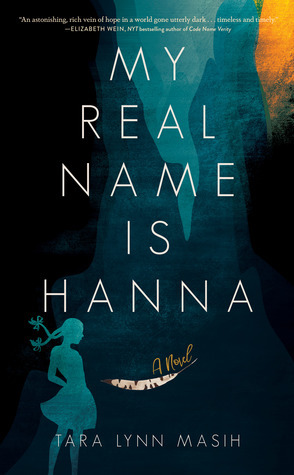 My Real Name is Hanna is richly told with simple language and represents to me a poignant celebration of the will to survive. I highly recommend it to all historical fiction readers. It’s a high quality read. Thank you to Rochester Public Library and the Libby app for lending me a copy of this book. Sharing this story with her daughter, now, from when this begins in May of 1941, she shares this story with us, as readers, her personal petition that this story, their family story, be held in her daughter’s memories. Life in Kwasova in the days before the war was simple and good, with their life filled with the daily rituals, the small tasks throughout the day, and prayer. But life changes as often as their country’s borders change, and historically they have been Ukrainian, Polish or Austrian citizens. On the day that Hitler invades, the 1st of September 1939, they are Polish, and the border is now down the middle of Poland. As the Nazis take over, hostility toward Jews increases, the number of people they can trust decreases, and by 1942, life is unsustainable there, and they make plans to leave, but it takes time to gather that which they hope to keep, and what they, reluctantly, must leave behind. They leave their home on October 12th of 1942, with Hanna leaving a note that includes all of their names, including their dog and horse, and the ages of the children, asking the person who finds this list to please say these names out loud, and then bury the paper in the yard. Once they leave, their journey is fraught with problems that start out small and few between, but as time goes by, and food is scarce or impossible to find. Shelter that they once had they are forced to leave until they seek shelter in a cave. Knowing the alternatives, there are few complaints at first, but as time goes by, the effects of living like this begin to take a toll. While the Nazi Camps are mentioned, the focus of this story is on this one extended family and their fight for survival in a story that is incredibly compelling, but without the descriptions of the horrors we have all come to know of by reading about the Holocaust. This is categorized as a Teens & Young-Adult novel, but can be appreciated by all ages. Tara Lynn Masih - Tara Lynn Masih is editor of The Rose Metal Press Field Guide to Writing Flash Fiction, The Chalk Circle: Intercultural Prizewinning Essays (winner of a Skipping Stones Honor Award; a Benjamin Franklin silver medal award; and a ForeWord Book of the Year Award), and author of Where the Dog Star Never Glows: Stories. She is the founding series editor of The Best Small Fictions. My Real Name Is Hanna, her debut novel for young readers and adults set in WW II Ukraine, received a FLORIDA BOOK AWARD and a SKIPPING STONES HONOR AWARD, appeared on Goodreads' 2018 Ultimate Fall YA Reading List and their Best of the Month Sept. YA list, and will be translated into Slovak. AITL Media selected her for an Inspirational Woman in Literature Award for 2019.